For the last two years, I have often heard parents talk enthusiastically about the book The Wonder Weeks. Eight predictable, age-linked leaps in your baby’s mental development characterized by the three C’s (Crying, Cranky, Clingy), a change … and the development of new skills. “Our research has shown that from time to time all parents are plagued by a baby who won’t stop crying. In fact, we found that, surprisingly, all normal, healthy babies are more tearful, troublesome, demanding, and fussy at the same ages, and when this occurs they may drive the entire household to despair. 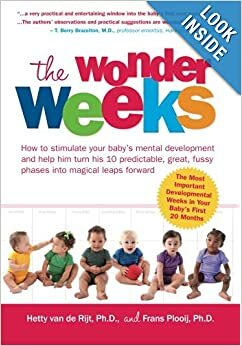 From our research, we are now able to predict, almost to the week, when parents can expect their babies to go through one of these “fussy phases.” ” (http://www.livingcontrolsystems.com/wonder_weeks/content_ww.html). I haven’t read this book yet, but after hearing good reviews about it and looking over the website, I thought I would share the fact that it exists with you in case it is of interest to you. It looks very interesting to me and I plan to read it at some point, but I didn’t want to wait to share it with you. On this page http://www.livingcontrolsystems.com/wonder_weeks/content_ww.html you can scroll down and see their chart for ages 0-61 weeks old that shows ages when baby is more fussy, your baby is uncomplicated, and your baby is especially happy. Thanks for the info Ellen! I will do a post on that so people can see that. Being a parent you need to know how to track a cell phone without installing software so you can monitor your kids' devices sneakily.